PTZ dome 2MP 30x clear indoor in-ceiling IP dome camera with clear bubble and indoor inceiling housing. 30x zoom, 1080p HD. Essential Video Analytics, Intelligent Dynamic Noise Reduction, remote camera access, and dual power options. The With AUTODOME IP 5000i cameras, you can capture full details of your surveillance space and identify activity details in the scene. The integrated 30x optical zoom lens allows covering large field of views from a single camera. The latest sensor technology combined with the sophisticated noise suppression results in an exceptional sensitivity in color. The low-light performance is so good that the camera continues to provide excellent color performance even with a minimum of ambient light. The camera comes with 3 pre-tuned scene modes to match various lighting conditions. Users can complete the configuration without going through multiple imaging settings. Standard: For indoor fluorescent lighting. Sodium-lighting: For scenarios where the video is captured under sunlight in the day or under sodium vapor lamp at night. The camera is designed on the most efficient and powerful H.264 and H.265/HEVC encoding platform. The camera is capable to deliver high-quality and highresolution video with very low network load. With a doubling of encoding efficiency, H.265 is the new compression standard of choice for IP video surveillance systems. Smart encoding capabilities, together with Intelligent Dynamic Noise Reduction technology and analytics, make the bandwidth consumption drop to extremely low levels. Only relevant information in the scene, like motion, or objects found with the analytics, need to be encoded. The camera is capable of quad streaming which allows the camera to deliver independent, configurable streams for live viewing, recording, or remote monitoring via constrained bandwidths. Recording management can be controlled by the Bosch Video Recording Manager application, or the camera can use local storage and iSCSI targets directly without any recording software. A memory card (SD, SDHC, or SDXC) up to 2 TB can be used for recording "at the edge" or for Automatic Network Replenishment (ANR) technology to improve the overall recording reliability. Pre-alarm recording in RAM reduces bandwidth consumption on the network and extends the effective life of the memory card. Essential Video Analytics on the edge The camera includes the latest release of Essential Video Analytics application from Bosch for use on prepositions. The Essential Video Analytics application provides reliable video analytics for small and medium business, large retail stores, commercial buildings, and warehouses. Advanced tasks like multiple line crossing, loitering, idle / removed object detection, crowd density estimation, occupancy and people counting are available for live alarming and forensic search. Object filters based on size, speed, direction, aspect ratio, and color can be defined. A simplified calibration mode reduces installation time significantly, because you only need to enter the installation height once for each camera, independent of pre-positions. After the camera is calibrated, the analytics engine can automatically classify objects as upright person, car, bike, or truck. recommendations allows users to customize device access. Network and device access can be protected using 802.1x network authentication with EAP/TLS protocol. Superior protection from malicious attacks is guaranteed by the Embedded Login Firewall, on-board Trusted Platform Module (TPM) and Public Key Infrastructure (PKI) support. future ONVIF Profile T. Compliance with these standards guarantees interoperability between network video products regardless of manufacturer. Third-party integrators can easily access the internal feature set of the camera for integration into large projects. Visit the Bosch Integration Partner Program (IPP) website (ipp.boschsecurity.com ) for more information. The camera allows for a total of 24 individual privacy masks, with up to eight displayed in the same scene. These can be programmed with four corners each. Each mask changes size and shape smoothly and quickly, ensuring that the covered object cannot be seen. The camera supports 256 pre-positions and two styles of Guard Tours: Pre-position and Record/Playback. The Pre-position tour has capability for up to 256 prepositions with a configurable dwell time between prepositions and can be customized as to the order and the frequency that each Pre-position is visited. The camera also provides support for two (2) recorded tours, which have a total duration of 15 minutes of movements. These are recorded macros of an operator’s movements, including pan, tilt, and zoom activities, and can be played back in a continuous manner. Pan and tilt preset repeatability are accurate to within ±0.1 degrees to ensure that the correct scene is captured every time. The camera delivers maximum pan speed of 300 degrees per second and maximum tilt speed of 200° degrees per second. The camera is capable of manual speeds (pan and tilt) of 0.1 to 120 degrees per second. The camera provides a pan range of up to 360 degrees continuous rotation. 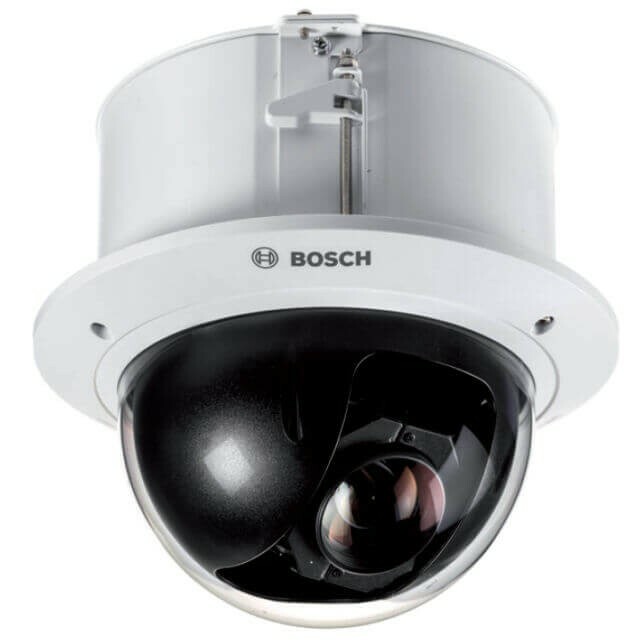 The camera has been designed for quick and easy installation, a key feature from Bosch IP video products. All housings feature recessed screws and latches for increased tamper resistance. Bosch designed the camera with the knowledge that field cables and mounts are installed before the camera is mounted. The installation concept allows a single person to connect the cables directly to the camera without re-routing cables. The camera is easily secured to the mount with a single screw. The pendant housings are rated to provide IP66 protection and offer an operating temperature range down to -40 °C (-40 °F). The pendant camera comes fully assembled with a sunshield and ready for wall or pipe applications with the proper mounting hardware (sold separately). Bosch offers a full complement of hardware and accessories (sold separately) for wall, corner, mast, roof, pipe mount, and in-ceiling applications for indoor and outdoor environments, which allow the camera to be adapted easily to individual site requirements. NDP-5502-Z30 PTZ dome 2MP 30x clear IP66 pendant IP dome camera with clear bubble and indoor/outdoor pendant housing. 30x zoom, 1080p HD. Essential Video Analytics, Intelligent Dynamic Noise Reduction, remote camera access, and dual power options. NDP-5502-Z30C PTZ dome 2MP 30x clear indoor in-ceiling IP dome camera with clear bubble and indoor inceiling housing. 30x zoom, 1080p HD. Essential Video Analytics, Intelligent Dynamic Noise Reduction, remote camera access, and dual power options.